Bhavaprita Hasta Mudra is fourteen aesthetic hand positions that apply pressure on the different areas of hands and fingers. They have been used for many centuries in India for healing the mind, body and emotions. In the brain the hand takes up a very large proportion of the brain’s cortex, and each area of the fingers and hand is linked to a different part of the brain. When we apply pressure to the fingers and hands, we stimulate related brain areas that flow of that energy within the body. It creates a subtle connection with the instinctual patterns in the brain and influences the unconscious reflexes in these areas. The internal energy is balanced and redirected, affecting change in the sensory organs, glands, veins and tendons. As well our fingers have the characteristics of these elements and each of these five elements serves a specific and important function within the body. The fingers are essentially electrical circuits. 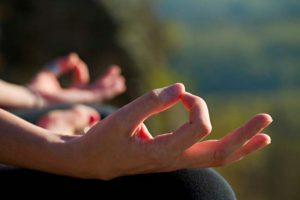 The use of mudras adjusts the flow of energy – affecting the balance of air, fire, water, earth, ether – and facilitates healing. These yogic mudras, you can learn to practice by Sacchidanandaprem Swamin who has learned it with Himalayan spiritual masters.